This Baked Tofu with Bok Choy and Easy Peanut Sauce is the perfect meal for a busy school night! It also keeps well, so you can make a double batch and refrigerate the leftovers (keeping the sauce separate) to have ready for a quick lunch or dinner! Serve with brown rice, quinoa or cauliflower “rice” for a complete meal. Add the tofu to a sheet pan and toss with one tablespoon of the coconut oil. Lay flat in a single layer and bake for 30 minutes. Flip every 10 minutes, until tofu is crispy on the outside. Meanwhile, add the peanut butter, water, 1 garlic clove, tamari and ginger to a blender and blend until smooth. Set aside. While tofu is baking, add the remaining tablespoon of coconut oil to a medium-sized pan over medium heat. Mince the remaining garlic clove and add to the pan along with the baby bok choy. Sauté for 5 minutes, or until tender. 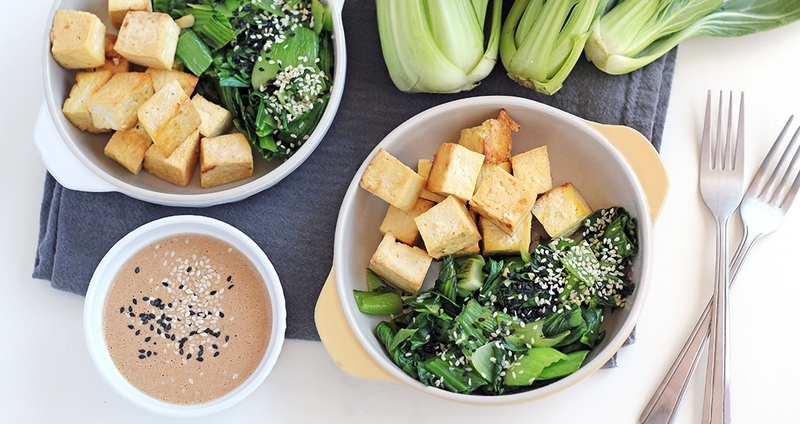 Serve bok choy and tofu warm, drizzled with peanut sauce.